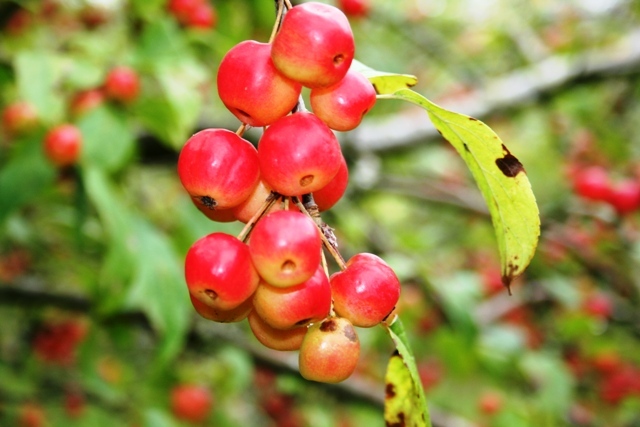 Crab apples have generous pectin levels, therefore the margin of error for first time jelly makers (moi) is generous and it’s easy to get right. From a bag full of the little golden balls – Golden Hornets in this case – come jars full of jewel-imbued fragrant jelly for toast, crumpets, an accompaniment to roasted game and a luxurious addition to gravy. As I pick up the crab apples from the ground, barely making a dent in the halo of gold emanating from the trunk, he laments the lack of understanding for good food today, how his co-workers would readily opt for a MacDonald’s over a bunch of his rainbow chard, beetroot or cabbage. The old arguments of chopping down rainforests, polluting the environment, exploiting workers, eating crap that is bad for you, all raise their insistent heads once more. We embrace all of this and reject homegrown veggies? For how much longer? 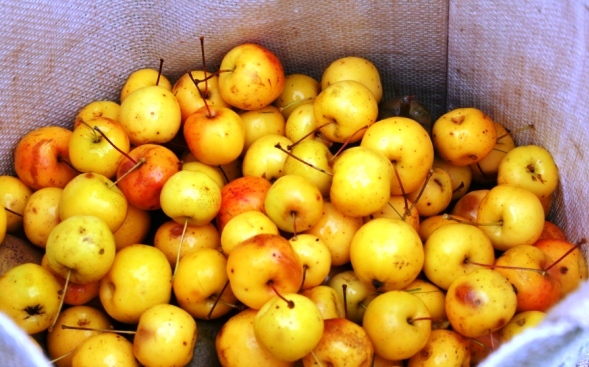 Wash and pick through the apples, taking out any majorly bruised ones. Put them in a large pan and cover with water. Leave to boil slowly for about 30 minutes to an hour until the flesh is soft. Upturn a stool or a chair and attach a square of muslin with string to the legs. Pour the fruit into the muslin and let it drip through overnight (do not be tempted to push it through otherwise the jelly will be cloudy). The next morning, throw the pulp on the compost and measure the juice so that it is 10 parts juice to 7 parts sugar. Add lemon juice if desired and keep at a steady boil for about 40 minutes, skimming off any foam. 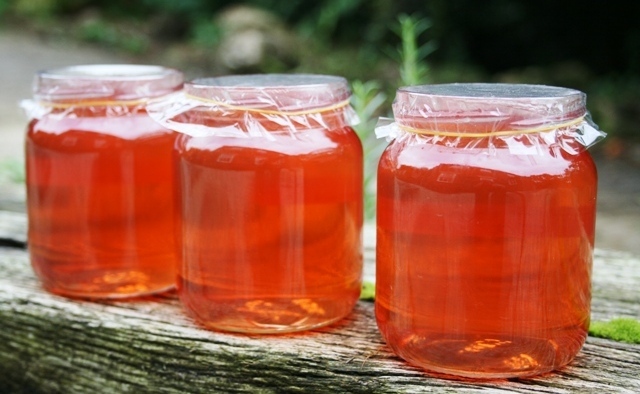 To test if the jelly is ready – put a spoonful on a saucer, leave it to cool and if it sets, you are ready to go. Pour into sterilised jars and enjoy. This entry was posted in recipes, seasonal and tagged crab apples, John Harris, Monty Don, moon gardening, River Cottage, Tresillian House. Bookmark the permalink. Not by me! My mother didn’t make jelly. The jelly bag, a clean pillowcase hung from a rafter, was for grapes, red currants or quinces. She canned (preserved) them whole, by the quart. (Pre metric!). We sucked them by the stem while clove-scented syrup dripped down our chins. A neat pile of naked cores grew. There was a protocol to this. The best technique required sucking the skin off whole first. Points lost for dropping bits. Then, acclaim for naked cores, stems intact. Seeds propelled at your siblings, bonus points. The cloves, swelled from syrup, looked like primeval drowned trees. I posted twice–Facebook shows you my real name. It didn’t pop up so I thought it “pending”. You have the power to delete?. Can you please delete the second? I bought russets yesterday! Yay! Quinces, where oh where? The ones in the market are moribund. That evocative smell, I search in vain. I’m not likely to get to jelly this fall. Our season is farther along than yours. But thank you for reminding me–marmalade oranges, real marmalade oranges only come in to Toronto once a year and that time is now. I agree, thanks bunny. You have quinces. *Sigh*. Sacred to Aphrodite, for these Atalanta paused. Not gold! Wikipedia. I jumped the marmalade gun, um, crock. Sevilles arrive here end of December, January-ish. Blogosphere says the best are from Yuma Arizona USA, not Spain. Hi Rachel, thanks for putting a searchable thing on. I’m looking forward to breakfast in Bodmin simply by searching “Bodmin” AND/OR “brekkie”. We don’t get the garlic leaf wrapped Yarg in Canada. We don’t even get Yarg in Canada. I’m making a 1,000 mile trek just for Yarg! Not. My daughter is at Yale. I contacted Lynher Dairies after I saw that it is retailed in North America only at Whole Foods in Manhattan. Logistics! emailed me the deets. Pengreep Dairy, Ponsanooth. Meet the ladies bovine. So to be clear, the Golden Hornets go in skins, cores, seeds and all (no bruises) and then the muslin filtering. No spices. Thanks for the clarity (and recipe), dear!